This beginners' class introduces pulling and decorating sheets of pulp for paper. 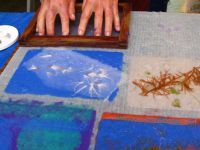 Six vats of various pigmented and/or natural fibers will be available for you to dip, stencil, laminate, collage, and experience many ways to create decorative papers with wet fiber. One vat of "surprise" pulp which may be denim, iridescent mica, seaweed, or floral inclusions will be available. A brief introduction to the basic steps in the papermaking process will include preparing pulp, then pulling and couching fresh sheets of paper varying in size and shape, followed by a hands-on exploration using tools such as shaped moulds, turkey basters, and prepared bottles of pulp "paint." Discussions include papermaker's tools and the history of hand papermaking.